It is a known fact that the Sun gives out different types of radiations. The "visible light" radiation helps you see everything around you, while the infrared radiations are felt as heat and the Ultra Violet (UV) radiations cannot be seen or felt. This is the radiation that is of concern these days. Apart from the sun, welding machines, tanning beds and lasers too emit UV radiations. Excess exposure to UV radiations can cause sunburns which in turn can affect the DNA in your skin cells. Exposure to these rays can affect the cells in the eyes, the lens and the cornea and can also cause early cataracts in individuals. Though a small amount of UV radiation is necessary for vitamin D formation that helps in developing strong bones, onemust be careful about the damaging effects of these rays. What if its not sunny? A cloudy day doesn't mean there is no UV radiation, and hence, you must continue protecting yourself. How can we reduce UV rays from the sun? Naturally, the ozone layer blocks a large part of these harmful radiations from entering the Earth's surface. However, pollution and changes to the environment has damaged the protective ozone layer, allowing a greater amount of these rays to enter the Earth. How do you protect yourself from harmful UV radiations? Eyes: Wear sunglasses whenever you are outdoors. Choose glasses whose lenses cut out 99 to 100% of both UV A and UV B rays. Opt for wraparound glasses that provide better protection. Remember that the degree of darkness of a glass doesn't have anything to do with the extent of protection. Wear a hat for better results. Your skin: Simply try to avoid being in the sun during the day. Look for shade. Beaches, sand, snow and water reflect UV light and can increase the chances of you receiving it. Windows of cars and houses block a part of the UV rays and can cause lesser damage when compared to direct sunlight. Dark coloured, full-sleeved, closely woven fabrics provide a certain amount of protection from these radiations. Some detergents and fabrics come with UVP (UV Protection factors) that increase protection. Choose the right type of sunscreen lotion. SPF number (Sun Protection Factor) is the level of protection your sunscreen provides against UV B rays only. Very few sunscreen labelled "broad spectrum" are available that protect against both UV A and UV B rays. Products that contain avobenzone, ecamsule, zinc oxide, or titanium dioxide can provide some protection from UVB and most UVA rays. The higher the SPF number, the greater is the protection. Be generous with application. 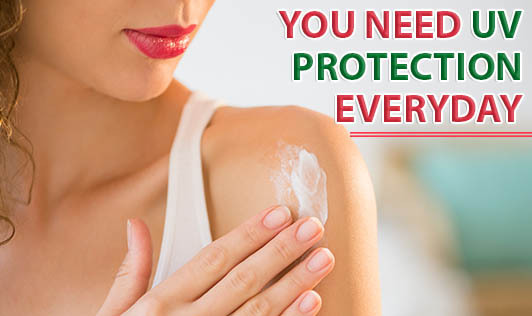 Use a palmful of sunscreen for your arms, legs, face and neck. For best results, it is good to apply sunscreen every 2 hours if you are outdoors. With environmental changes taking a toll on our health, isn't prevention better than cure?